The season of neighbourhood potluck parties is here. Do you know what you’ll be bringing? 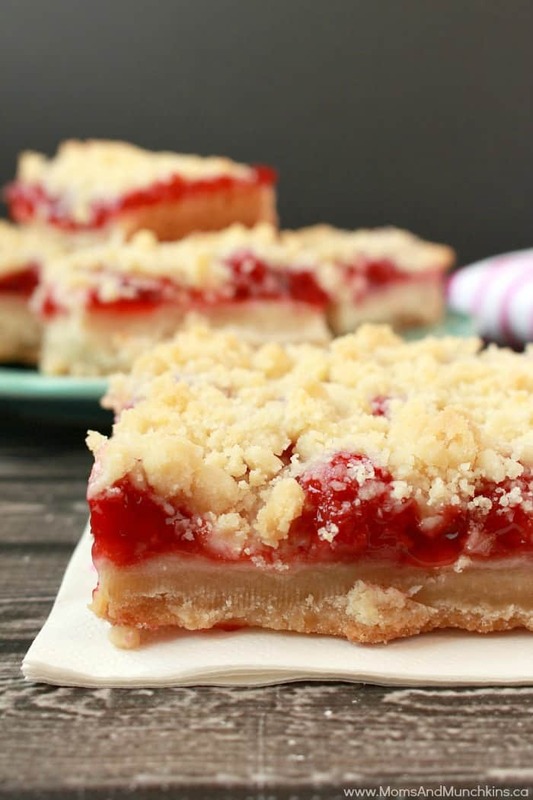 I usually bring my Greek Pasta Salad but I’ve been switching it up lately with desserts. With outdoor parties in the hot summer season, you have to be extra careful about what you serve to your guests. You may have the best recipe for homemade ice cream but it’s just not the same when it melts into ice cream soup. Hey – I’m not picky and I’d probably still try some. Ha! 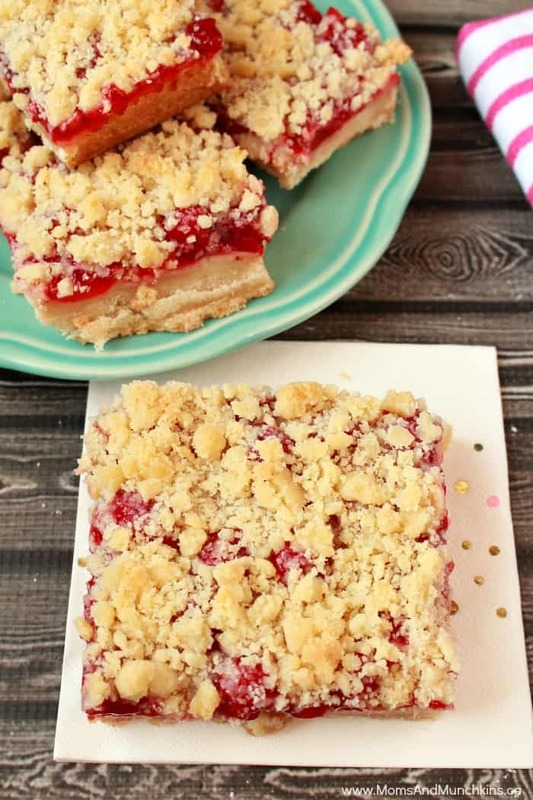 For an easy dessert recipe that would hold up okay on a party dessert table, you’re going to love this Cherry Pie Bars recipe. It’s quick and easy to make – just 5 ingredients – and it’s delicious too! No need to worry about this dessert melting quickly in the sun. Not a fan of cherry pie filling? No problem! Switch it up with apple pie filling mixed with caramel sauce (you’ll find this in the ice cream toppings aisle of the grocery store) or even a lemon pie filling with some sweetened shredded coconut mixed into the crust. Whisk butter, granulated sugar and brown sugar together until well mixed. Add flour and stir to combine until the mixture is crumbly. Set aside 1 cup of the crumbled mixture to use later as the topping. Press the remainder of the crumbled mixture into the parchment paper lined pan and press down on mixture firmly to pack it down. Add pie filling evenly over crust. Sprinkle the remaining 1 cup of crumbled mixture over the pie filling. Let cool at least 2 hours before cutting into squares. 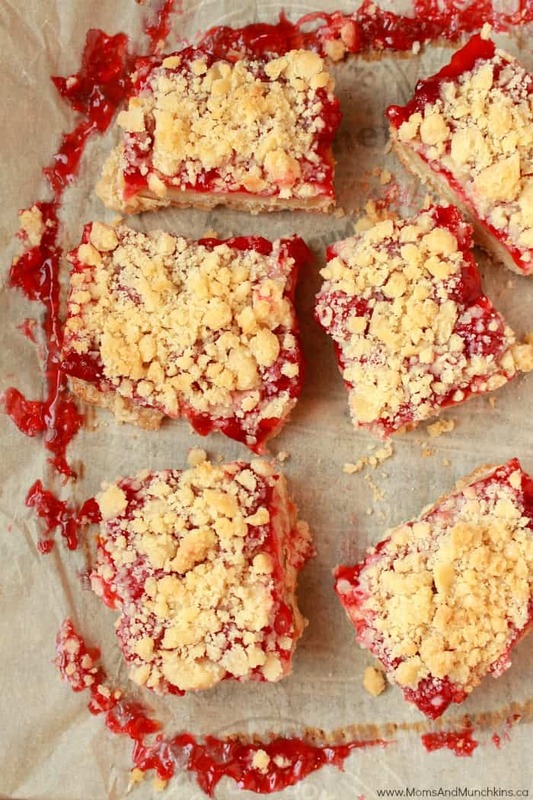 Love cherry pie desserts? 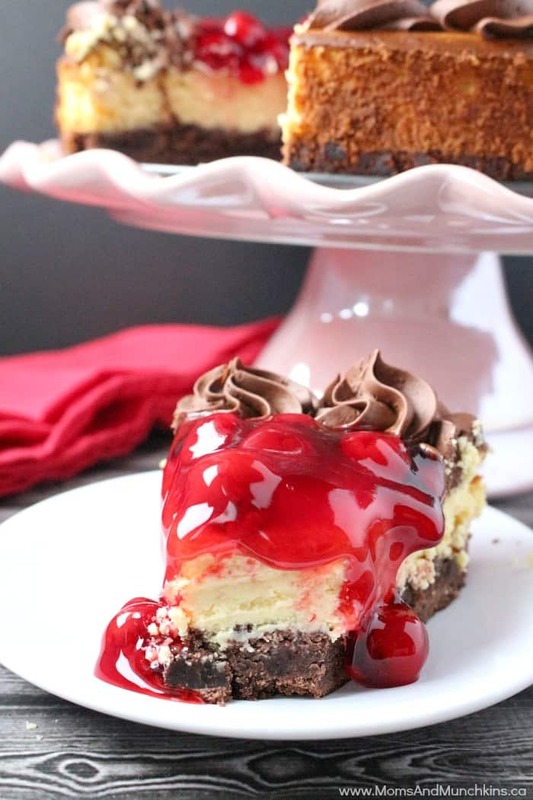 Check out this Chocolate Cherry Cheesecake recipe. 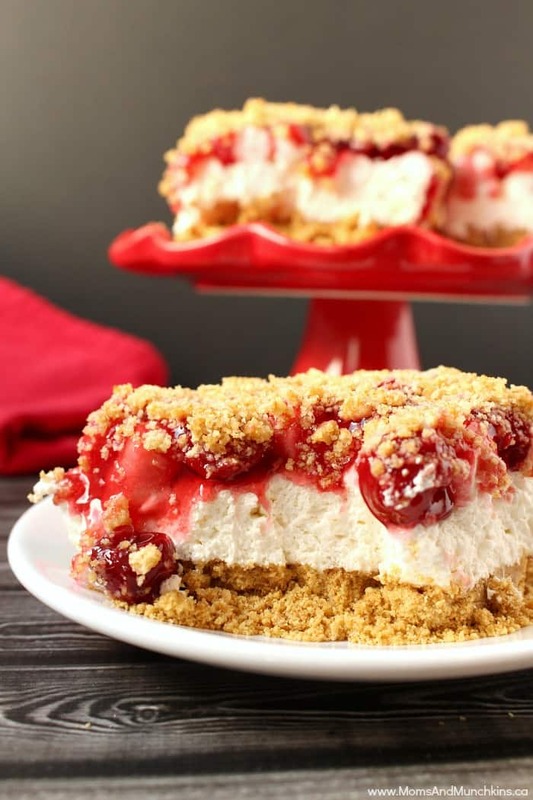 Or this irresistible No-Cheese Cherry Cheesecake dessert. 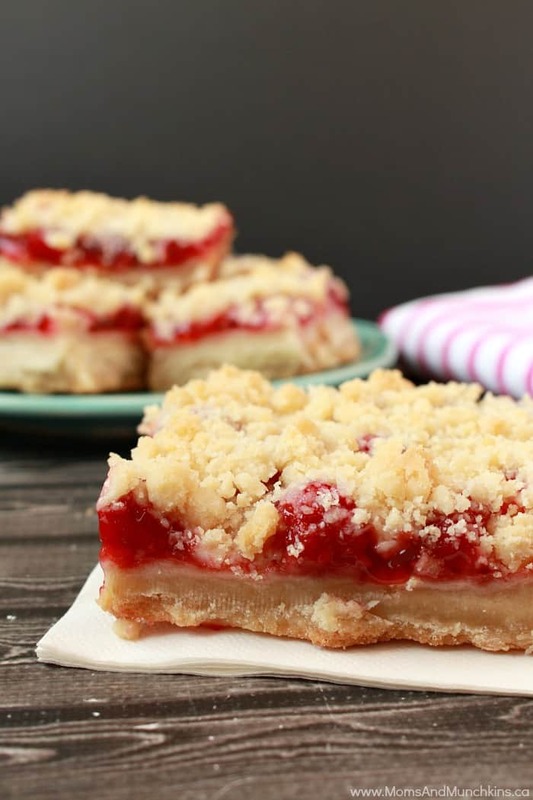 For more delicious dessert ideas, visit our Desserts page. Stay updated on the latest updates by following us on Facebook, Instagram, Pinterest and Twitter.